As part of NASA's "wireless-in-space" initiative, Digi International's TechEdSat 5 -- a device about the size of a fire extinguisher -- containing Digi XBee radio frequency (RF) modules was released into Earth's orbit at an altitude of approximately 250 miles by the International Space Station. Digi XBee RF modules, taking the place of wired connections in the satellite, operated as wireless "data-crossroads" between TechEdSat 5 key components. Every 10 seconds, the modules transmitted orbital data such as translational acceleration, angular rate, temperature, atmospheric pressure, magnetic field, and strain, which will later be used in the design of future satellites, Digi International said. 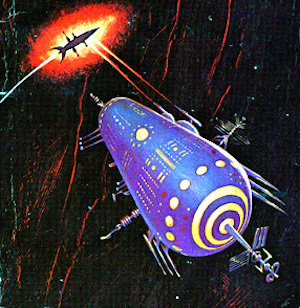 Communication in the solar system is one of the ambitious projects put forward by communications engineer - and science fiction writer - George O. Smith in his 1942 story QRM - Interplanetary. Smith writes extensively about the need for solar system-wide communications.